Mitt Romney and Barack Obama are visiting these key swing states on the day before election day. U.S. President Barack Obama and Republican challenger Mitt Romney have made their final arguments to voters in key political battleground states on the eve of Tuesday’s 2012 presidential campaign. Both President Obama and Romney campaigned in states they need to win in an election that opinion polls say is very close. Republican presidential nominee Mitt Romney greets audience members at a campaign rally at the airport in Sanford, Florida, November 5, 2012. 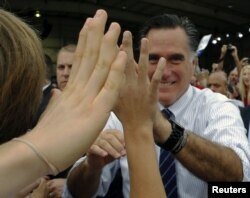 Romney told a boisterous rally in the state of Florida that he is the only candidate capable of bringing about change. Both campaigns predicted the winner will be determined by which of their operations can get the most supporters to the polls. In the state of Wisconsin, President Obama urged a crowd of cheering supporters to vote Tuesday. U.S. presidential elections are not decided by the nationwide popular vote, but by an Electoral College system. The importance of each state on the outcome of the election is approximately equivalent to its population. U.S. President Barack Obama addresses thousands in Madison, Wisconsin, November 5, 2012, on his last day of campaigning. Both candidates campaigned in the critical state of Ohio on the eve of the election. Larry Sabato is director of the Center for Politics at the University of Virginia. Political polls say the race is very close nationally. But state-by-state surveys show Obama with narrow leads in many closely contested states likely to determine the outcome. Along with the race for president, all of the seats in the House of Representatives and a third of the 100 Senate seats are being contested. Most analysts predict Republicans will continue to hold their majority in the House, while the president’s Democratic Party is likely to maintain a slim majority in the Senate. Millions of voters already have cast ballots under early-voting rules. But the vast majority of the electorate still will head to polling places throughout the U.S. Tuesday.